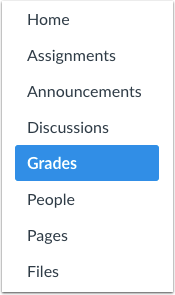 By default, you can view unpublished assignments in the Gradebook. This setting can be turned off at any time. When unpublished assignments are visible in the Gradebook, unpublished assignments display with a gray background. Unpublished assignment columns do not include a dash indicating that grades cannot be entered. Additionally, assignment menu options are not available until the assignment is published. 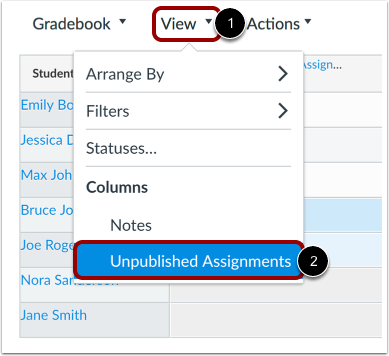 Unpublished assignments are not visible to students. Click the View menu  and click the Unpublished Assignments link . View the unpublished assignment column. You can view the assignment name, but the cells are grayed out and are not editable until the assignment is published. To hide unpublished assignments, click the View menu  and click the Unpublished Assignments link . Previous Topic:How do I use the Notes column in the New Gradebook? Next Topic:How do I create assignment columns for non-submission assignments in the New Gradebook? 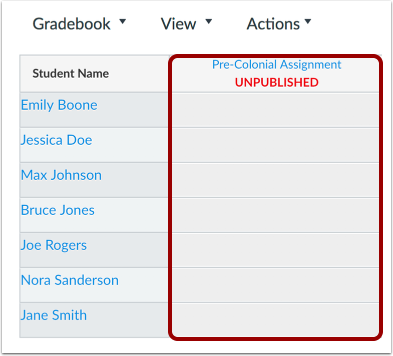 Table of Contents > New Gradebook > How do I view the Unpublished Assignments column in the New Gradebook?